Is Dell Serious about Linux? Is Dell Really Serious about Linux? As far back as I can remember, Dell has been cosily in bed with Microsoft. During Microsoft’s anti-trust trial in the late 1990s, Dell was seen as one of Microsoft’s strong supporters. Dell’s closeness to Microsoft yielded some valuable benefits against rivals like Compaq, HP and other PC vendors. The US Justice Department said in court filings that Dell paid a lower price for Windows because of its close relationship with Microsoft. So I’m rather flummoxed to see Dell’s new found love for Linux. 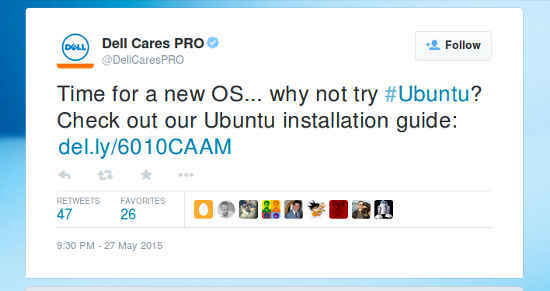 Not only does Dell now offer a range of low-priced notebooks running Ubuntu but the company has been tweeting, horror of horrors, how to install Ubuntu on Dell systems (see picture above). And all this when Microsoft is set to launch Windows 10 in a few months. I don’t know about you but I smell something fishy here! Is Dell hedging its bets or does it think Windows 10 is really not that big a deal despite all the noise Microsoft is making about the upcoming upgrade to the pathetic Windows 8.1? Or is something else happening behind the scene? 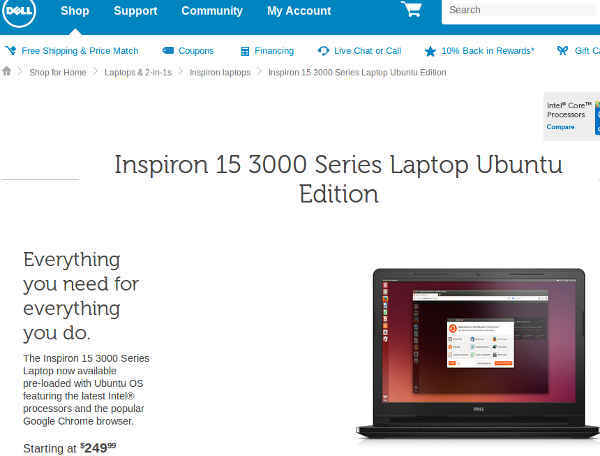 Dell offers four models of its Inspiron I5 3000 Series laptops with Ubuntu pre-installed at prices ranging from $250-$350. The entry-level Inspiron 15 3000 Series laptop with Ubuntu 14.01 (specs – 4GB RAM, dual core Celeron, 500GB HDD, 15.6-inch screen, WiFi, Bluetooth) looks interesting and at $249.99 a product that schools might want to purchase to give students their first introduction to Linux. Besides the Inspiron I5 notebooks, Dell offers two other Ubuntu computers targeted at developers – the Dell XPS 13 laptop and the Dell Precision M3800 mobile workstation. Dell has flirted with Linux in the past but in a more flippant way than now.